QAnon "research" about human trafficking created in 8chan was tweeted by Charlie Kirk. How did that happen? Charlie Kirk, founder of conservative campus organization Turning Point USA, doesn’t normally respond to fact-checking. For example, he repeatedly tweets a misleading statistic that purports to compare violent crime rates between the U.S. and U.K. However, Kirk did seem to respond to fact-checking when he deleted this July 7 tweet. These figures appear to show a massive increase in arrests for human trafficking under President Trump. It incorrectly asserts that human trafficking arrests more than doubled halfway through 2018, when compared to all of 2016. Kirk’s tweet falsely claimed that the figures came from the “Department of Justice.” The figures, in fact, came from two separate sources. The 2010-2016 figures came from a Washington Examiner article that cites ICE statistics. 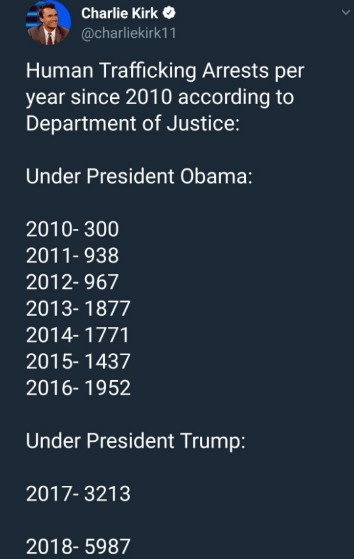 But the 2017 and 2018 figures came from “research” performed by the QAnon community. After I tweeted evidence of the the connection between Charlie Kirk’s tweet and QAnon, my tweet thread was promoted by some media figures on Twitter, such as Senior Editor of The Atlantic David Frum. Soon after, Kirk deleted his tweet without explanation. This left an unresolved mystery: how did bogus statistics created by believers in a crazy internet conspiracy theory find their way to Charlie Kirk’s Twitter account? Kirk is a mainstream pundit, not a fringe conspiracy theorist. He regularly appears on Fox News, meets with President Trump, and has a busy schedule speaking all over the country. Here’s the short answer: the bogus statistics started on 8chan and traveled through Reddit before they were finally tweeted by Kirk. 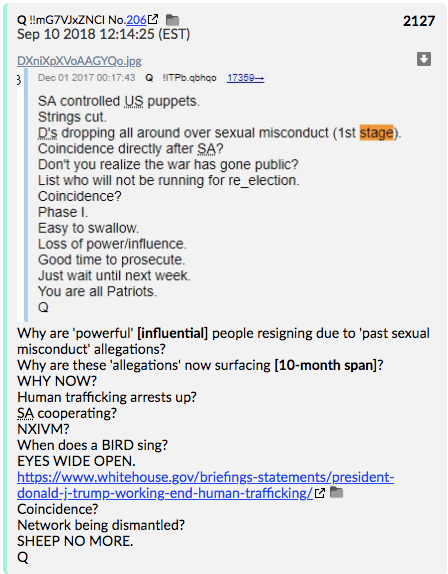 First, Q told QAnon believers that human trafficking arrests were up. This spurred QAnon’s “researchers” to compile news stories about arrests and convictions. A prominent member of the QAnon community named “412 Anon” used this research to create visual dashboards of the data. Redditors condensed this bogus data from the dashboard into an image to make it easier to share on social media. Finally, the statistics from the Reddit generated image were tweeted by Charlie Kirk. However, Kirk’s tweet ignored the original sourcing and falsely claimed they came from the Department Of Justice. QAnon researchers speculated that Saudi Arabia, Hillary Clinton, and the Democrats generally somehow profited from worldwide human trafficking. 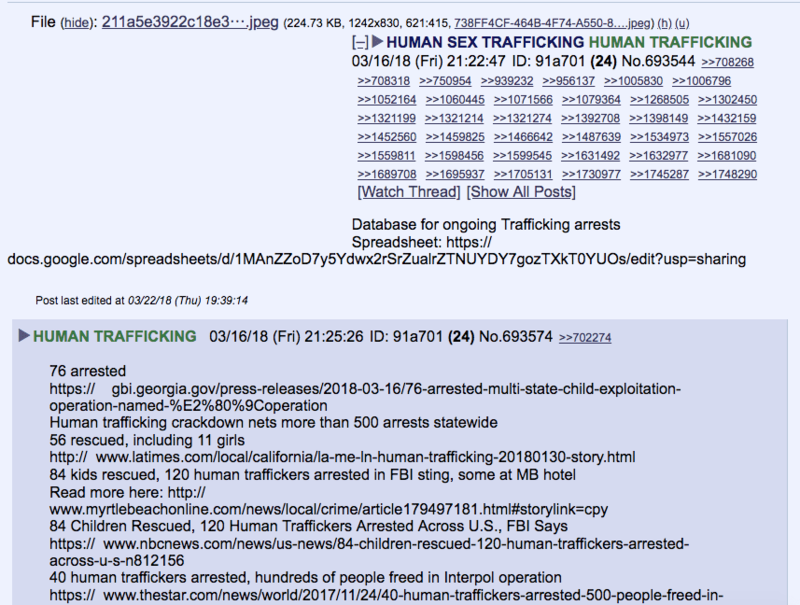 In response to these kinds of comments from Q, QAnon believers on 8chan’s /qresearch/ board went to work gathering news stories about human trafficking arrests. The information from these stories was then compiled into spreadsheets. These statistics were then visualized by 412 Anon, a data scientist and regular contributor to the 24/7 Youtube Livestream Patriots’ Soapbox. 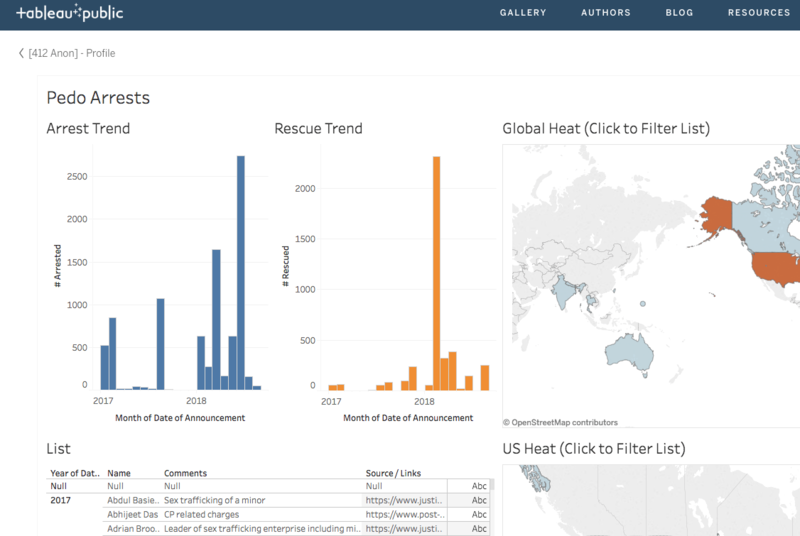 412 Anon entered the data into a Tableau Public dashboard. 412 Anon explained the board in an interview with Youtuber SGT Report. That data from 412 Anon’s public dashboard was then condensed into a sharable graphic by Redditor TommyRobinsonsGhost. 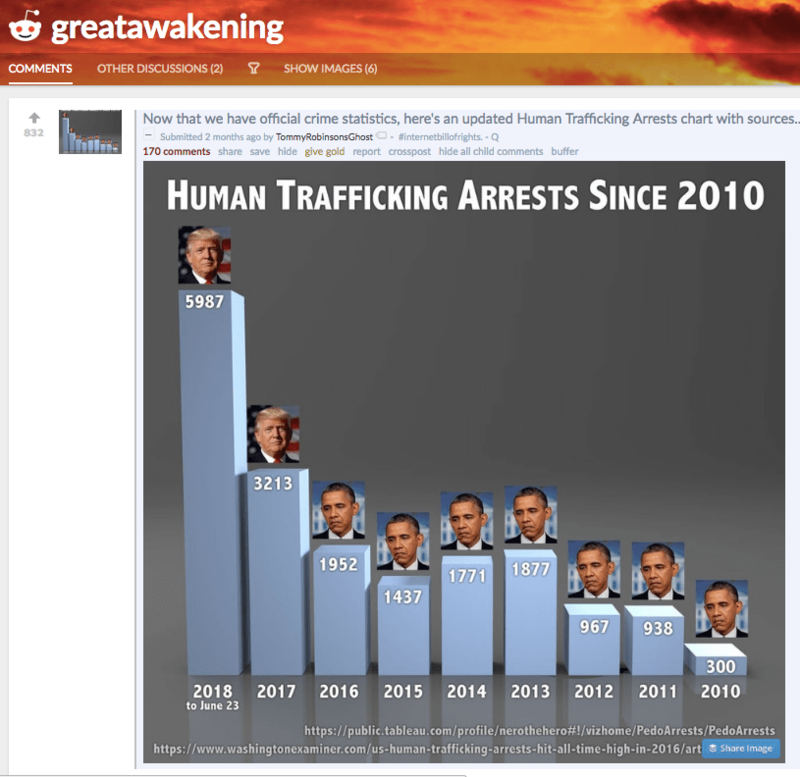 In June, an image titled “Human Trafficking Arrests Since 2010” was posted on the now-banned subreddit /r/greatawakening. TommyRobinsonsGhost’s image accurately cites the source of the 2017-2108 figures: 412 Anon’s “Pedo Arrests” dashboard. It also accurately cites the Washington Examiner article that is the source of ICE arrest figures from 2010 to 2016. However, the image failed to note that the two sources relied on two completely different methods of data gathering. The inconsistency means it can’t be used to accurately conclude that human trafficking arrests have increased nationwide. Somehow, the figures from TommyRobinsonsGhost’s graphic were copied exactly into Charlie Kirk’s tweet. But Kirk’s tweet ignored the old source and instead falsely claimed the numbers, which in truth partially came from researchers on 8chan and 412 Anon, were generated by the Department of Justice. In each stage of this journey, the theory about Trump supposedly taking down human traffickers was turned into a format that was more concrete and easier to digest. 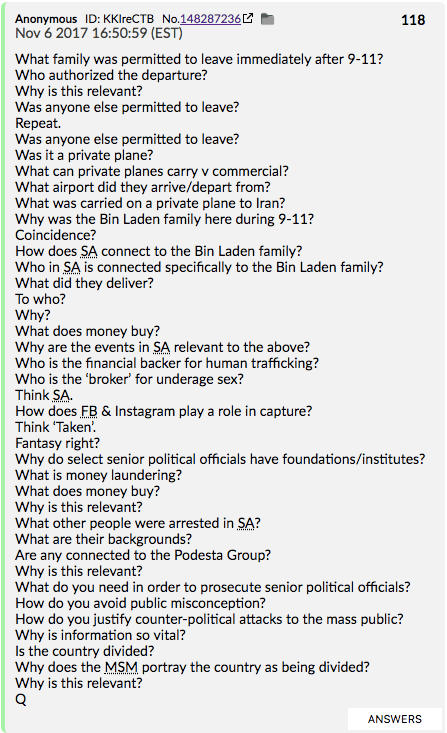 Q kicked it off by asking vague, cryptic questions. On 8chan, the format was a long list of articles and a spreadsheet. 412 Anon tuned that into a visual dashboard. TommyRobinsonsGhost turned the dashboard into a graphic. And finally, Charlie Kirk turned that graphic into a tweet for his over 700,000 followers. Talking points and figures are traditionally crafted by politicians, consultants, pundits, and public relations professionals. These narratives are then distributed to the wider public through various media channels. But this incident in which Charlie Kirk signal boosted a QAnon theory proves that political narratives and theories don’t have to come from the top down. Talking points can be forged in the darkest corners of the internet, such as 8chan, the dark web, or Discord servers. Though they are created by anonymous people with unknown agendas, these ideas can travel all the way to mainstream figures such as Kirk for “normie” consumption. Which means, possibly, that the anons may have more power to shape mainstream political views than anybody is willing to acknowledge.